Koi wa Ameagari no You ni should be in this list. I certainly think it’s the most well-made. Its direction is top-notch, and I’m fascinated by its storytelling. The problem is that I don’t like the story it wants to tell. 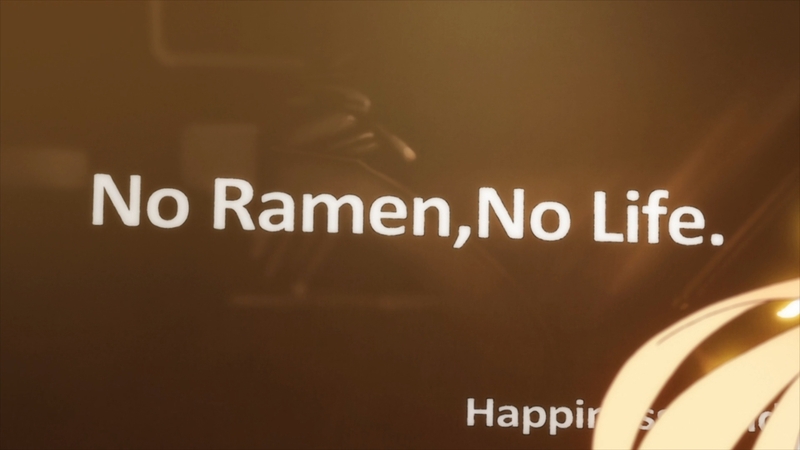 As for everything else, Hakata Tonkotsu Ramens is a fun time-waster. I just don’t have much to provide in terms of analysis. In the first half of this week’s episode, the four kids get together to play a game. If you’ve seen the first season at all, then you know exactly how this is going to pan out. Hotaru will explain how the game works, whip out her special trump card, then lose anyways because Saya is the appointed “game genius.” As a result, this episode is a retread. In fact, the vast majority of the second season has done little to differentiate itself as a sequel. It may as well just be an extension of the first season. The second half of the episode takes a turn for the sentimental as we see a younger Hotaru visit a general store. She was the same back then as she is now. 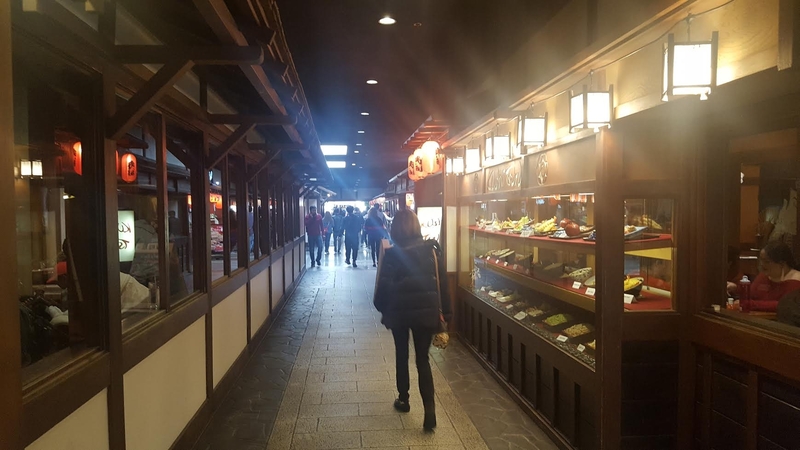 The shopkeeper laments that kids just don’t seem to be into dagashi these days, but she promises to return to the shop as long as it continues to sell dagashi. Back in the present day, the place has closed down and the land is up for sale. Feeling a bit emotional, Hotaru phones up Coconuts to tell him that she loves Shikada Dagashi. And that’s it. 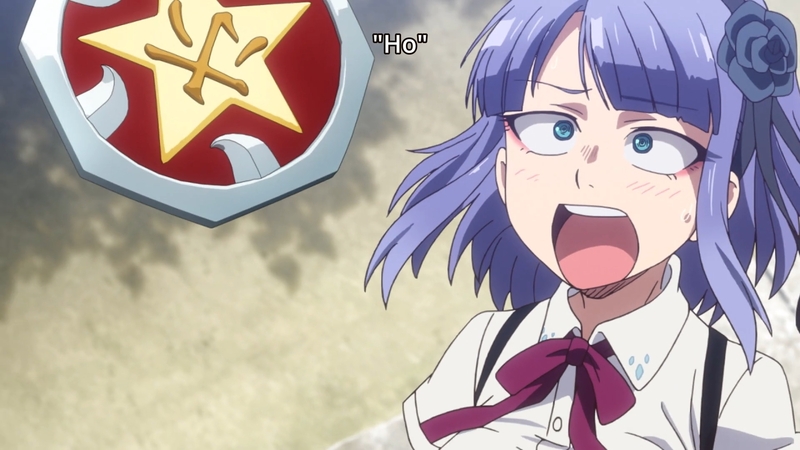 It’s a short, but sweet mini-vignette about a little girl who has never stopped loving dagashi. I kinda prefer these slower, less silly moments, but I don’t know if we’ll get much of them anymore thanks to the shorter episode format. 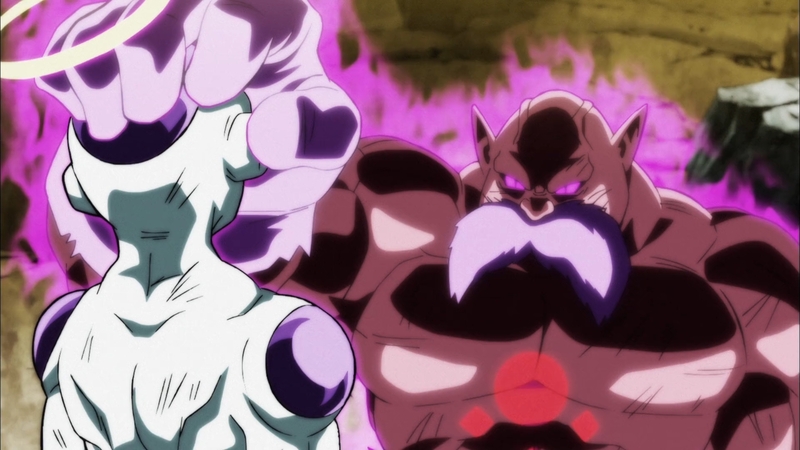 It’s going to be a complete asspull when Goku still manages to save the day. Grey alien dude deflects a Final Flash with his eyes. His eyes. What is this? Zoolander? How does Vegeta feel that he just lost to Blue Steel? Meanwhile, attacks are apparently completely useless against the Lorax-looking goober pictured above. I can’t say I didn’t enjoy Frieza getting humiliated, though. So how do you get to the mayor’s sadistic but well-protected son? Well, if he can’t stop buying girls to torture, why not pose as one and sell yourself to him? Since Lin fools people all the time with his schoolgirl outfit, this shouldn’t be too hard to pull off, right? Unfortunately, it appears as though Enokida has sold him out, so he falls into the hands of the Kakyuu Association again. Naturally, I expect Banba to come to Lin’s rescue in next week’s episode. 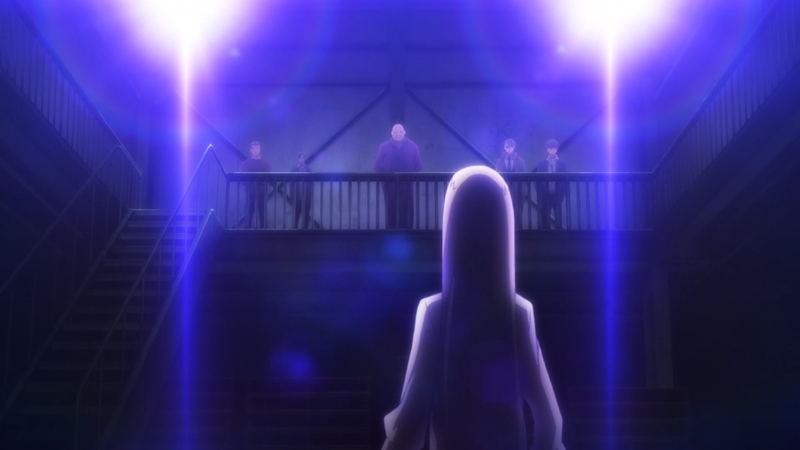 I also wonder how Banba’s going to feel about what Enokida just did… unless there are even more twists and turns, and our computer hacker is actually double-crossing the mayor’s goons. Anyways, I’m enjoying this show now that the story is fully underway. 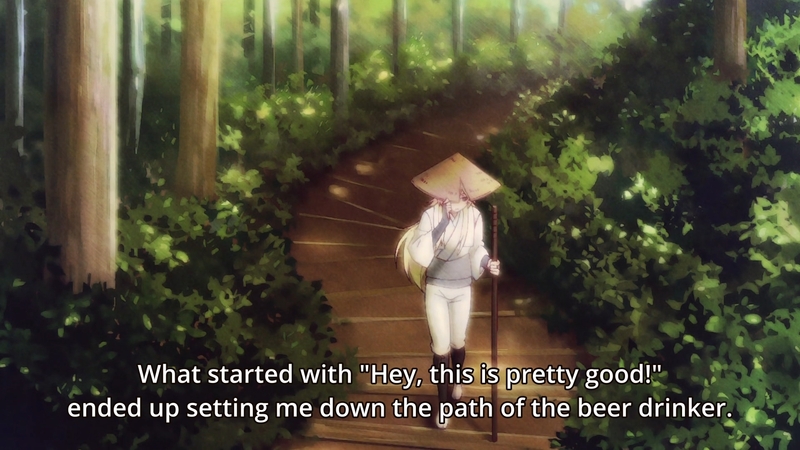 I don’t know how I feel about Saito as a character, though. He became a hitman just because he accidentally hit a batter in the head and nearly killed him? I know you gotta suspend your disbelief in order to immerse yourself in fiction, but that’s a bit silly, no? I didn’t expect Ivanov to die so easily, but then again, I don’t really care too much about his character. The samurai hitman thing is also a little silly, and as much as I’m enjoying it now, the story could be a lot better with a little editing. In “Shiver,” anyone who touches a jade carving of a bug will find themselves afflicted by a curse where holes open up all over their bodies. Neat idea, but the story was a little too short to send chills down my spine. Plus, I thought Rina’s voice acting was pretty bad, and it detracted from my enjoyment overall. 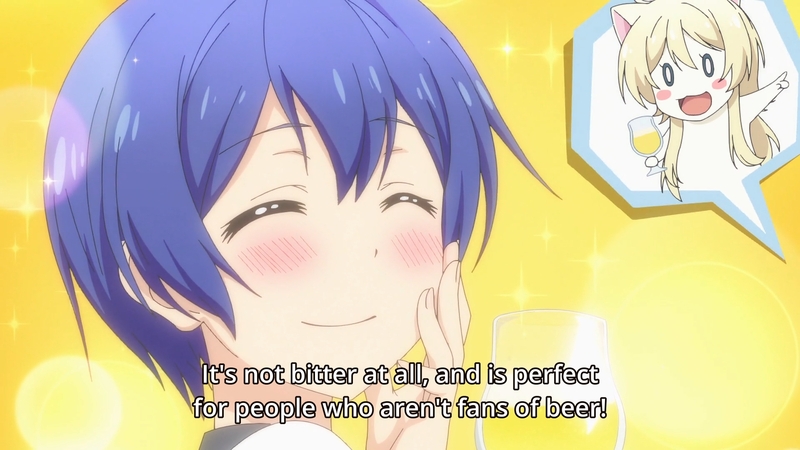 To be fair, Yuuji wasn’t much better. “House of Puppets” was fun. I actually haven’t read the original manga so this was all new to me. As soon as I saw Kinuko slap Jean-Pierre away, I knew she’d die eventually. Speaking of which, I bet the adaptation left out details about her relationship with Haruhiko. I thought they had just met up again; I had no idea they had become a couple until she started getting frustrated with his lack of communication. Lots of communication problems in these stories, by the way. The same thing happened in “Lovesick Dead.” I wonder how much better our protagonists would fare if they could just tell their women what was bothering them. 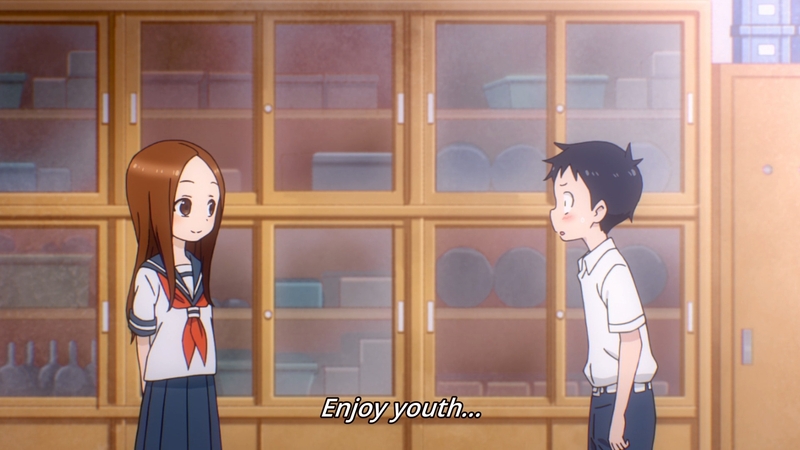 I guess people are starting to think that Nishikata and Takagi are a couple. Other than that, everything else has remained the same. 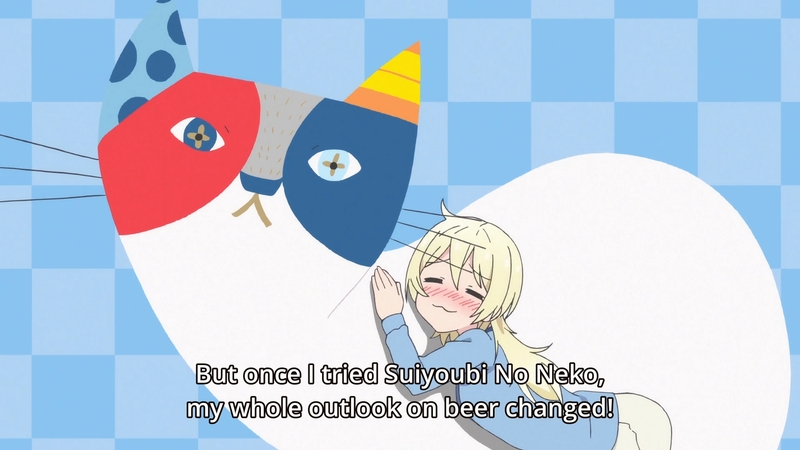 Still a cute show. Just don’t expect any character development. There was a lot of exposition in this week’s episode, and to make things worse, I was only half paying attention. Something about a tournament that protects the world because you gotta clean books or else book stains will turn into monsters… I think. And in magic world, there are people who are racist against normies like our heroine. Shizuka has to participate in the tournament because something about the Moon Princess and her mom. Finally, the main character ends up naked after trying to cast a supposedly basic spell. Shrug, whatever. Yep, yep, I’m sure I got the gist of it. Like Akko, Hazuki is kinda useless, and she screws up every time she tries to cast a spell. Akko is funny, though. Funny and annoying, but still funny nonetheless. Hazuki, on the other hand, is only annoying. Out of all the shows in this post, this is easily my least favorite. I’ll probably end up dropping it if nothing exciting happens soon. I’m just here for the ramen. 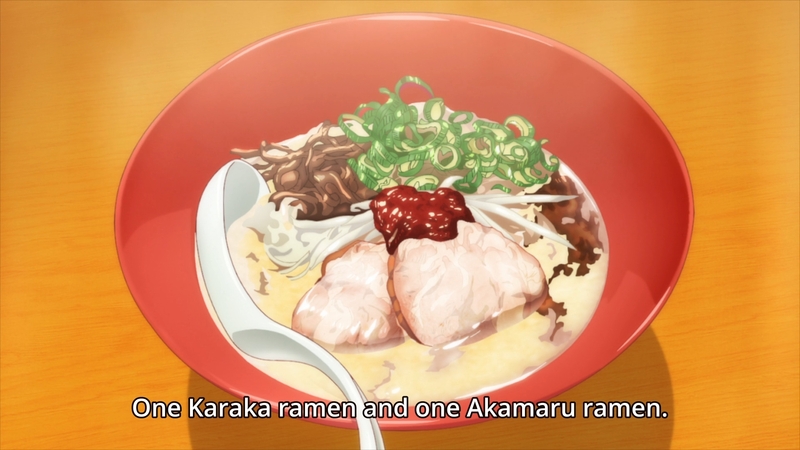 First, Koizumi-san hits up a western restaurant that happens to have a ramen corner in the back. 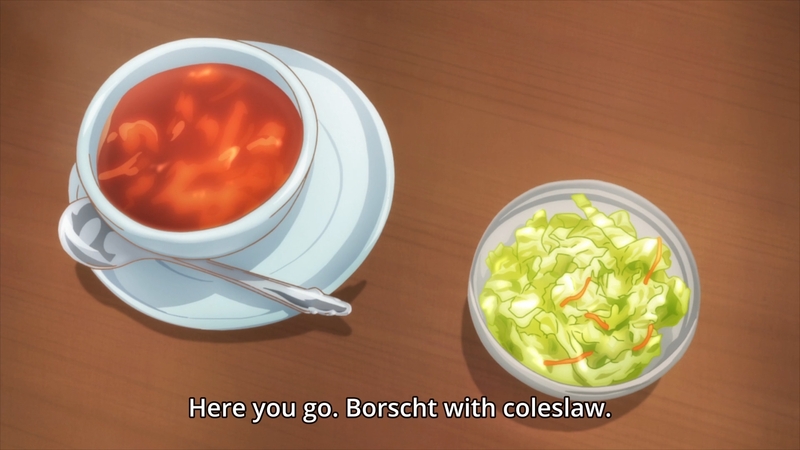 You can get borscht and coleslaw along with your ramen, which is certainly unique. 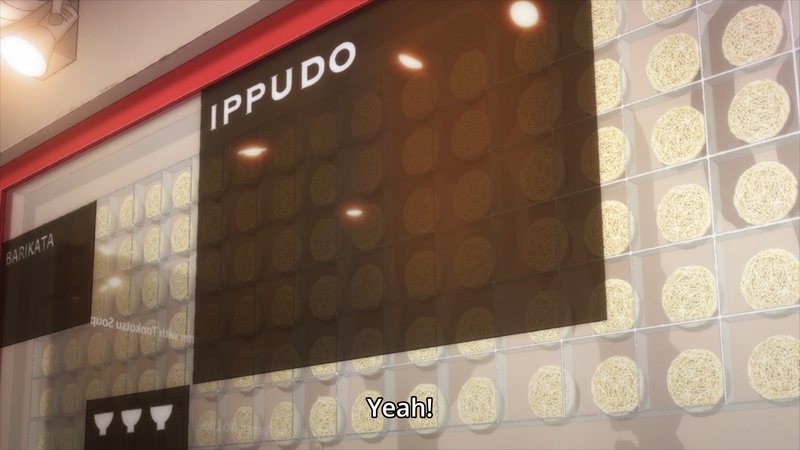 That strikes me as too much food, but it’s anime, so they have bottomless stomachs. 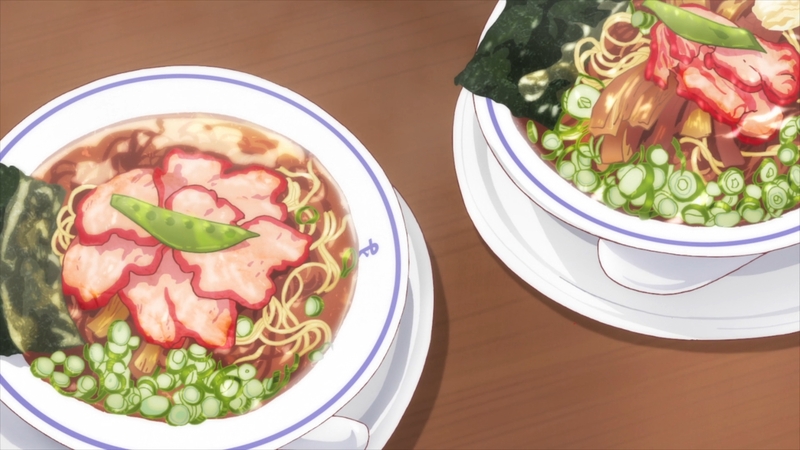 We also see bowls of char siu ramen (the subs say chashu, but they look more like char siu to me) and butter ramen. I wouldn’t mind trying the latter. 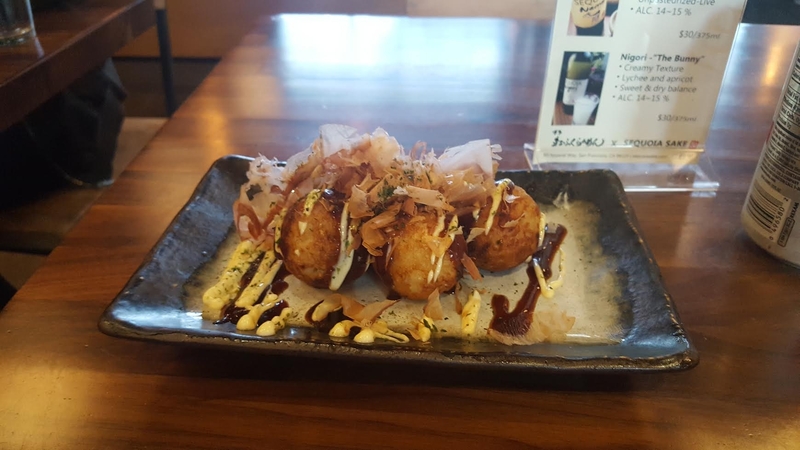 In the second story, Yuu and Misa visit Ippudo, the trendy ramen joint that has recently starting popping up all around the world. 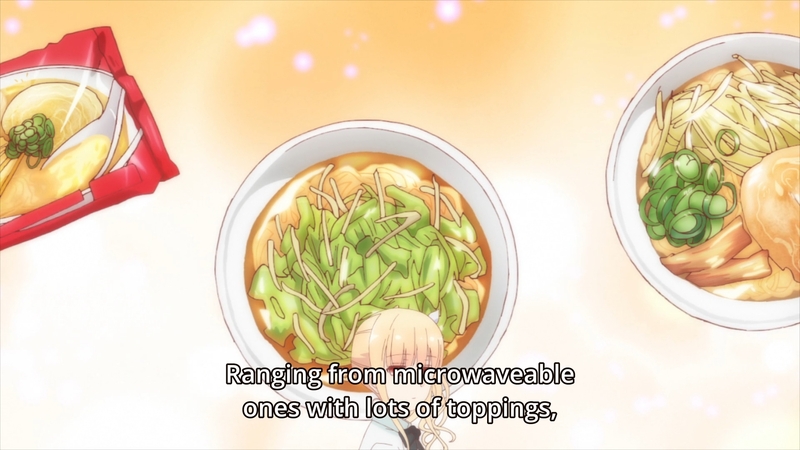 After marveling over some all-you-can-eat bean sprouts, they also enjoy a couple bowls of ramen. I forget what these are, though. After they leave, Koizumi-san visits the same restaurant and she always orders enough food to feed two or three people. 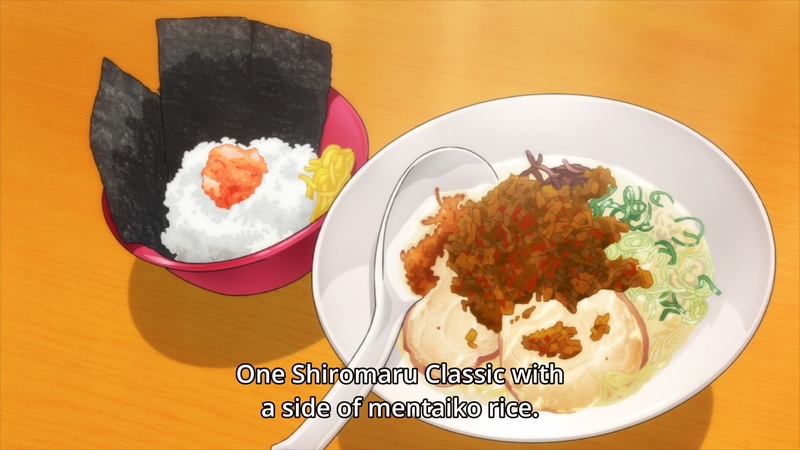 This time, she gets ramen along with mentaiko rice. Afterwards, she gets extra noodles and gyoza. 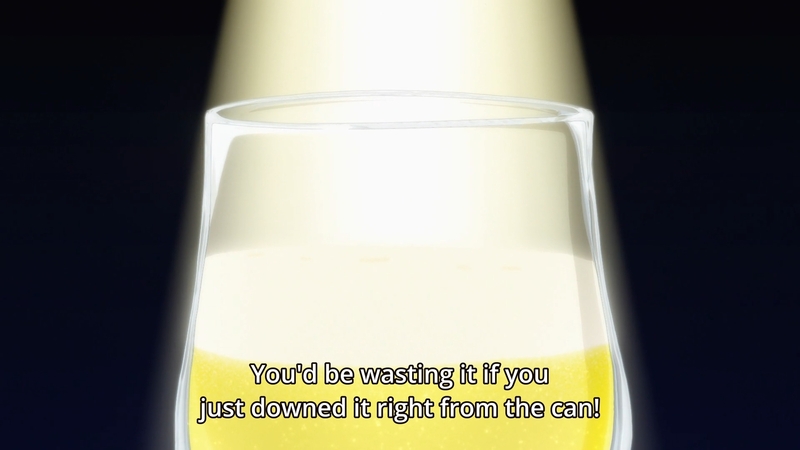 Personally, I do not like mentaiko at all. 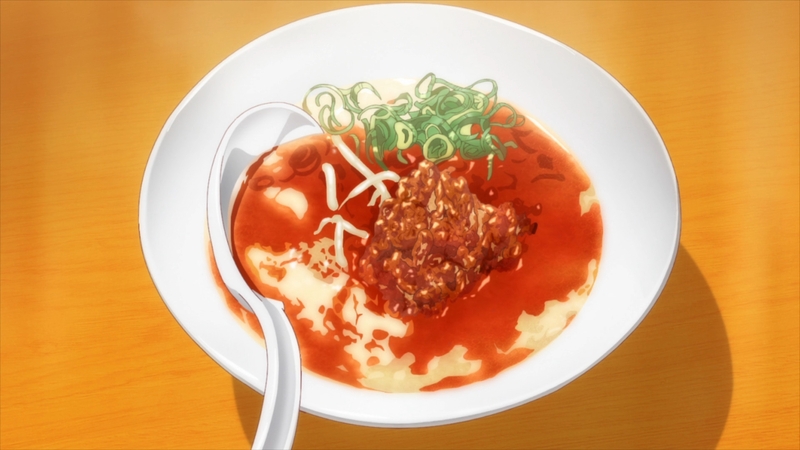 Finally, in the final story, Koizumi educates Jun on the beauty of conbini ramen. In other words, you can customize them to your taste. I’m afraid I can’t say I’ve ever loved instant ramen. Anyways, it’s time for me to talk about my own ramen adventures. I have no idea if people would rather have me talk more about Koizumi-san instead, but I’m in too deep now to stop. As a result, another week, another ramen joint. This time, I finally got around to hitting up Marafuku Ramen. Ever since the place opened up in Japantown, there has been nothing but nonstop hype for the restaurant. I had to see for myself if Marafuku Ramen was superior to Mensho Tokyo, my current favorite ramen joint in San Francisco. First, I got there around 1:30pm. In order to get a seat, you have to sign in on some iPad. I noticed that there were 30 people ahead of me, so I knew I was going to wait a while. I mostly killed time by walking around a nearby Japanese bookstore. 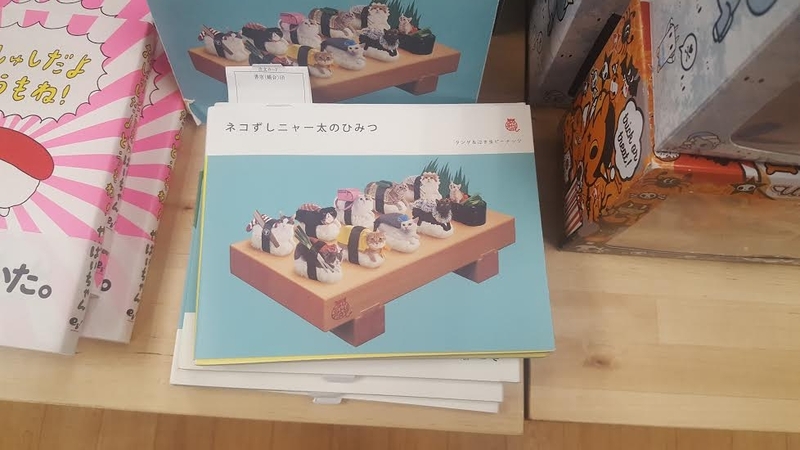 I even found this booklet full of photos of cats dressed up as sushi. Why? Your guess is as good as mine. There were a bunch of crepe shops and food stalls selling Japanese treats like taiyaki, but unfortunately, they were all cash only. I can’t even remember the last time I had cash on me. I took a peek down some pathway full of Japanese-themed restaurants, but I didn’t bother to go any further. I finally got a text message from the restaurant; my table for one was ready. Oh, it only took me 72 minutes to get seated. Hakata Ramen comes from Fukuoka, a prefecture in Japan’s southern island of Kyushu famous for its pork dishes. Hakata is the home of tonkotsu, the no-holds-barred meatsplosion of porcine pleasure. 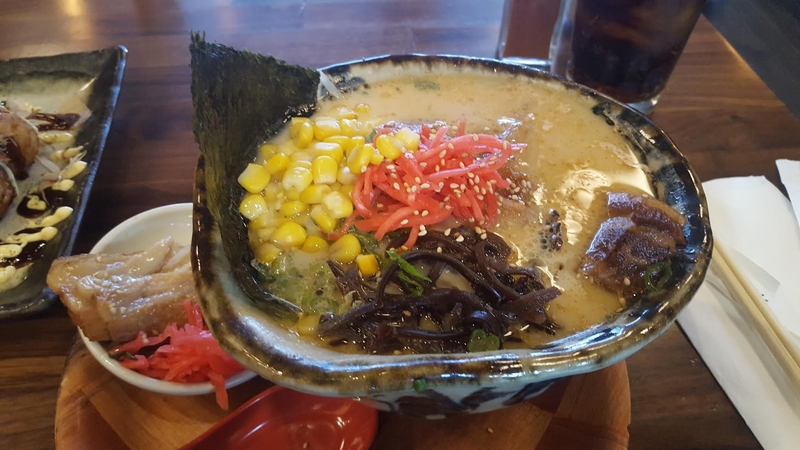 While many ramen broths are gently simmered to develop nuanced, subtle flavors, tonkotsu broth is cooked at a rolling boil, giving the soup its rich body, opaque appearance, and rich texture. It’s insanely popular and was the primary driver of the ramen boom in New York over the last decade or so. 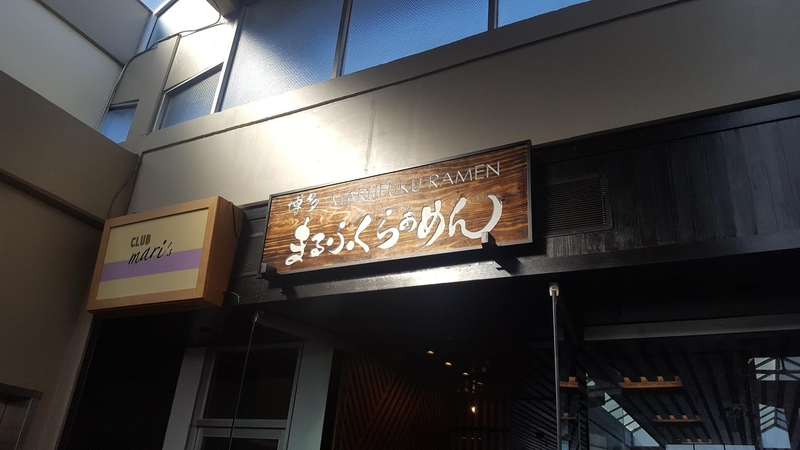 Fukuoka, of course, is the birthplace of the widely popular Ippudo chain of ramen-ya. In Hakata, the tonkotsu broth is generally seasoned with shio, in order to preserve the milky white color of the soup, though both shoyu and miso variations are not uncommon. Some shops will serve shoyu tare (a seasoned soy sauce mixture) as a table side condiment. Typical toppings include thin slices of chashu, wood-ear mushroom, beni-shoga, and spicy mustard greens—all powerfully flavored or textured stuff that can stand up to the intense pork flavor. Crushed sesame seed and crushed garlic can be served table side to add to taste. Speaking of Ippudo, one just opened up literally five minutes from my office in the Financial District. I’ll probably hit up after work pretty soon. But back to Marafuku Ramen, the regular bowl just comes with chashu. 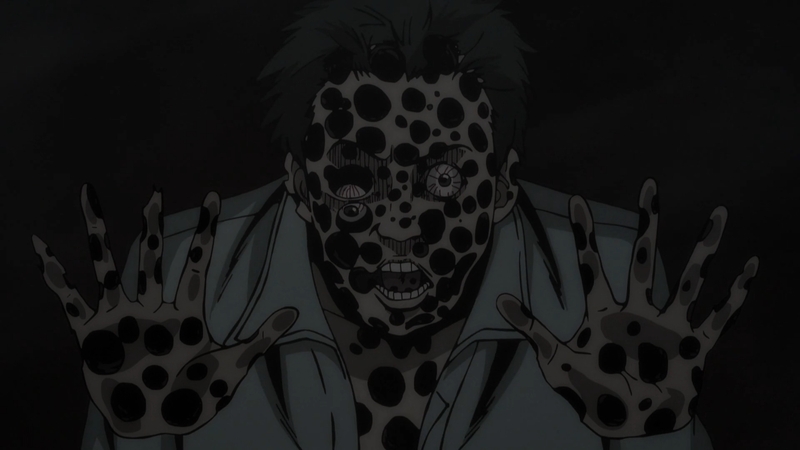 I got the DX which throws in some chunks of kakuni, i.e. braised pork belly. I also ordered extra chashu on the side, ’cause dammit, it’s nearly 3pm and I’m hungry. What can I say? I’m a weak man. They didn’t come out piping hot, though. That was a little disappointing. 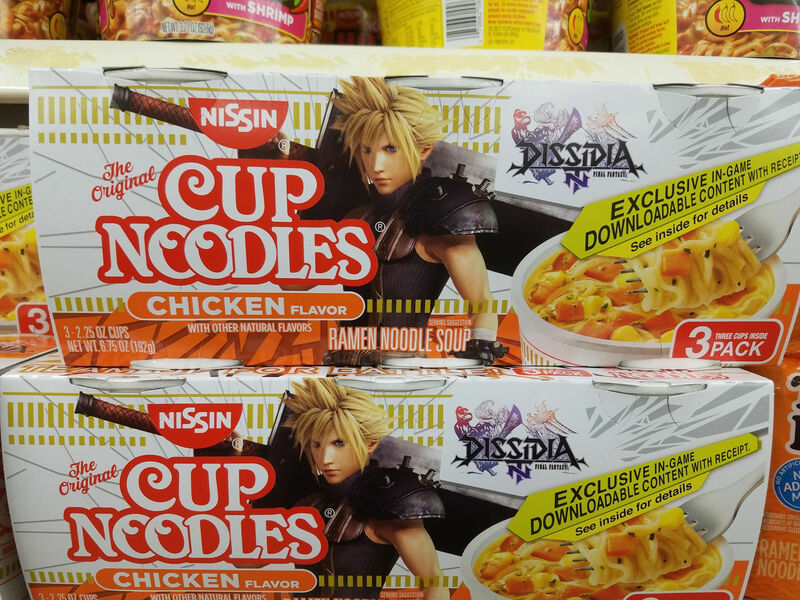 What about the ramen? The broth was great — better than the tonkotsu broth from Coco’s — but I still prefer Mensho Tokyo. Granted, I’m comparing tonkotsu to toripaitan, but still, nothing beats the richness of Mensho Tokyo’s toripaitan broth. The kakuni was so deeply flavored, though. You can tell that it had been braised a long time, because the meat took on a rich caramel flavor. It really reminded me of a similar pork belly dish my mom used to make when I was little. Unfortunately, the other toppings weren’t much to speak of. What worked perfectly for me with Mensho Tokyo was the way the rich, creamy broth was offset by the bitterness of the greens. I didn’t get any of that balancing act here. The toppings were just standard, and as a result, they were kinda forgettable. Did I enjoy Marafuku Ramen? Yes. But would I make the long trip out to Japantown just to wait an hour for one of their bowls again? Nah. Hey, I’ve had that beer before! I always knew deep down I was an anime character! Whoops, I drank it straight from the can. And I didn’t have it as a post-workout drink; instead, I was busy eating yakitori. Yeah, that’s true. I don’t really love beer (I prefer wine or, if we’re talking hard liquor, something like rum), and this one was alright. Okay, I definitely didn’t experience that. 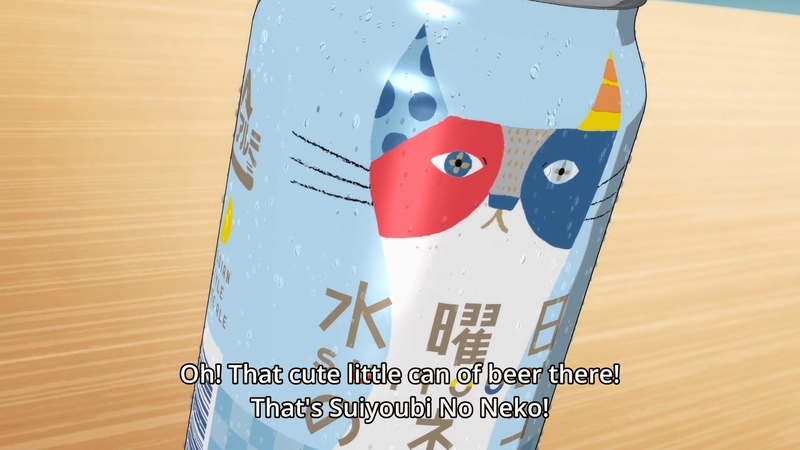 Basically, this episode is all about how to turn innocent children into alcoholics. 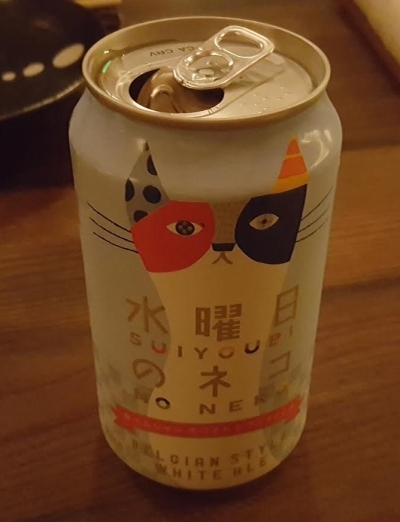 What you do is slap a cat onto the beer can and voila~! Uh, we learn that not all aradamas are bad. 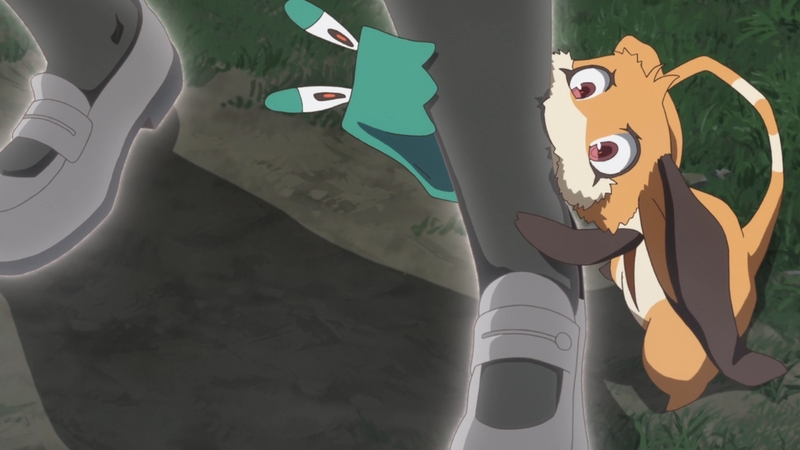 Kaoru apparently has one as a pet, and it even assists her in battle. There’s something going on about “S Equipments” being sent out without Yukari’s approval, so someone’s up to no good. 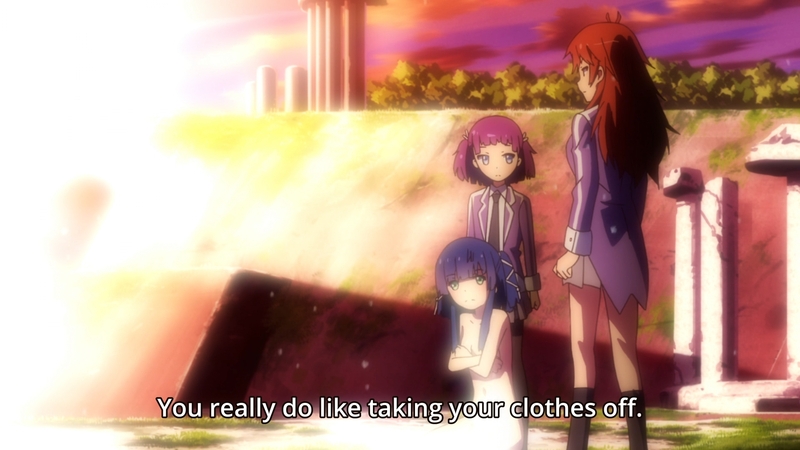 And finally, Hiyori tries to ditch Kanami because the latter isn’t a killer; apparently, she can only protect others. If she doesn’t have the resolve to kill, then she’ll just be useless on this mission. I dunno, I feel like anyone could kill if they’re pushed to the limit. Everyone has different limits, but that doesn’t change the fact that anyone can break. Kanami doesn’t kill, because she doesn’t have a good reason to. Give her a sob story about her mother wasting away due to some aradama masquerading as Yukari, and maybe she’d be a killer too. Anyways, our heroine predictably decides to stick by Hiyori’s side. She’s decided that her mission is not only to help Hiyori kill the aradama pretending to be Yukari, but also prevent her new friend from killing anyone else. Y’know, typical boring goody-two-shoes stuff. C’mon, no one in the audience seriously thought for the second that these two would split up. Furthermore, it seems obvious that Yukari isn’t straightforwardly evil. There’s a plot twist waiting to be revealed… just not anytime soon seeing as how this is just the fourth episode. While we wait for the other shoe to drop, the girls will continue to be chased. Chashu, or チャーシュー, is the Japanese reading of the Chinese word char siu, so they’re technically the same thing. I have never eaten char siu in China, so I don’t know whether there is any regional variation or not. Oh, is that so, thanks for the explanation. I really enjoyed when you wrote about food, btw. Ah, thanks. For me, it breaks up the monotony of shows I don’t care too much about. Too bad it’s infinitely more expensive than writing about anime.